Ageha's older sister is getting married. But Ageha, who suffers from an enormous sister complex won't accept it. One day, in order to get Ageha more involved in the wedding preparations, her sister takes her to Velvet Blue Rose, a shop run by Yukari and Mitsu, a two-man team that design and make wedding dresses. Ageha, who's favorite activity is making exquisite purses for her friends, falls in love with the shop immediately. Will Ageha get over her sister complex and lend her support to the wedding? If Yukari has anything to say about it she will!! This manga has great art, and an addicting story that keeps you reading. V.B. 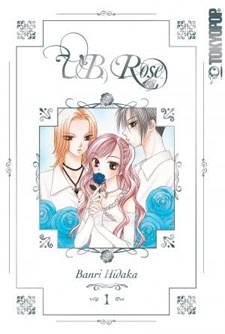 Rose had twelve volumes published in English by Tokyopop from January 8, 2008 to April 12, 2011, before the publisher became defunct. Story: It starts out pretty well for a romantic comedy--serious plot, light-hearted tone, and realistic emotions. When it got to the point where Hibari was married and Ageha could tolerate Hibari's marriage, I believe the story lost it's plot. When I was reading in the middle of volume two, I was curious to find out why this story was occurring (for a different reason rather than just Yukari and Ageha's love story). In volume 5, when Hibari gives birth to her baby that started the whole book in the first place, it lost what little story plot it had left. When it came to Ageha's love problems, I found them very relatable, and I enjoyed how Mitsuya acted as a sort of "cupid," trying to fix the couple's problems. But at times, I was just as frustrated as him when Ageha or Yukari would be "love-illiterate." Also, in volume 3, Ageha was worried about Yukari's feelings towards part timers. Then, in volume 5, the author brought that problem back, and I smacked myself in the head, thinking "Didn't we cover this already?!" At this point in the series, I believe it's just going to be more emotion swinging and still a small lack of plot until these two finally get together. Art: The art and pen work I believe is very elegant, and there's not a scratch out of place. I believe if the hair got more lines, it'd be perfect, but I'm not complaining. The clothes also look beautiful, and that's important for a wedding manga. Overall, it's just about perfect. Character: They are all quite memorable, but the author has me guessing on who this "Kana" is. From what I've seen, she hasn't appeared yet, but if she keeps dropping hints, I feel it will bring out the characters appearance quite well. Mitsuya's the typical perv, but he's also the "cupid," like I said earlier, so his role is quite apparent. Yukari is amusing, since he's just like a little girl in love, but also the timid bully that doesn't really know what affection feels like. Ageha's the typical teen, but that's what makes her memorable, since she has relatable problems. Overall, they're quite decent. Enjoyment: The lack of enjoyment for me is mainly because of the lack of plot. I personally think that good stories need a conflict, conclusion, and only a little epilogue. To me, this series has bam wham resolution, then tons of extras. Overall: Considering all of what I've said, it's an okay series. I won't be scurrying to find the next book when it comes out, but I won't just stop reading it either. I'm really loving this manga! I think its vary, vary cute & sweet! I love how its soo funny too! Lots of comedy! lol Its a vary nice shojo,romance,comedy manga! The charecters are so nice and funny! And the outfits are sooo cute! If you like Cute,funny, romance shojos, you'd probly like this manga! Overall: This is one of my Fave mangas now! I love it soo much! Surprisingly this story is really amazing. Ageha, the main character, I like her because she is kinda like a regular teenager, with regular teenage problems. To be exact I'm kinda like her; I'm nice, but not all that calm, and I have a high temper. Yukari is my main favorite(well actually both Ageha and Yukari). He may look like a handsome guy but he's actually a very violent person, that's what makes him so funny. No wonder, he haves a very high temper like Ageha! Mistuya is a pervert. -_- Not really much huh? But he does help Yukari and Ageha with "love" issues. I'll give him brownie points for that. I really love this manga, right from the very first page. It's an adorable and relaxing read. For a romance manga it's a pretty orginal plot, it starts off a teenage girl called Ageha, who has a serious sister complex and a love of designing and making bags. When her sister, Hibari, gets unexpectedly gets pregnant and decides to marry it really shocks Ageha. Eventually Ageha goes along with Hibari to a dress fitting at VBR, where she meets two gorgeous guys. Yukari and Mitsu help Ageha to accept her sister's marriage. From what I've read so far it's really heartwarming. I find the plot easy to relate to, since something similar happened to me, and generally over all I've loved every page. The blooming romance between Yukari and Ageha can be frustrating at times, but then unexpectedly sweet and loving. It's made my heart jump a few times, which is always a good thing to find in a manga! The characters are the make or break in a manga for me. If I can't relate or engage with the characters then I get bored very easily. But in V.B Rose I adore all of the characters, they each have depth to them and aren't very stereotypical. Ageha isn't a push over like you find in some mangas, she's strong independant, intelligent and spirited. As you see her overcome her mistakes she becomes more and more mature. Yukari and Mitsu are brilliant too, who wouldn't want to work with two gorgeous guys making wedding dresses?